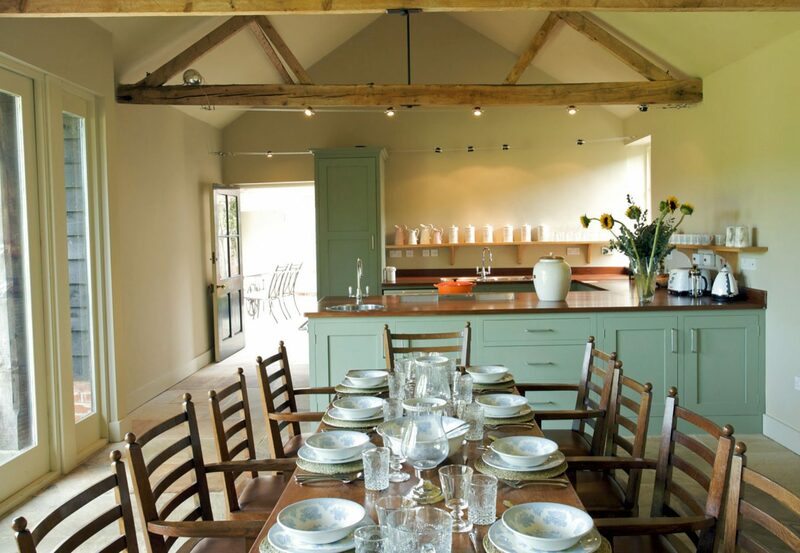 Set in the spectacular parkland of Sibton Park is this classic, rustic building. With exposed beams and large rooms The Barn is a luxurious Suffolk self-catering country estate cottage. 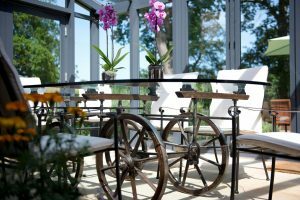 There are unique touches throughout with an eclectic mix of furniture with many bespoke pieces including an old casrt based table with glass top. 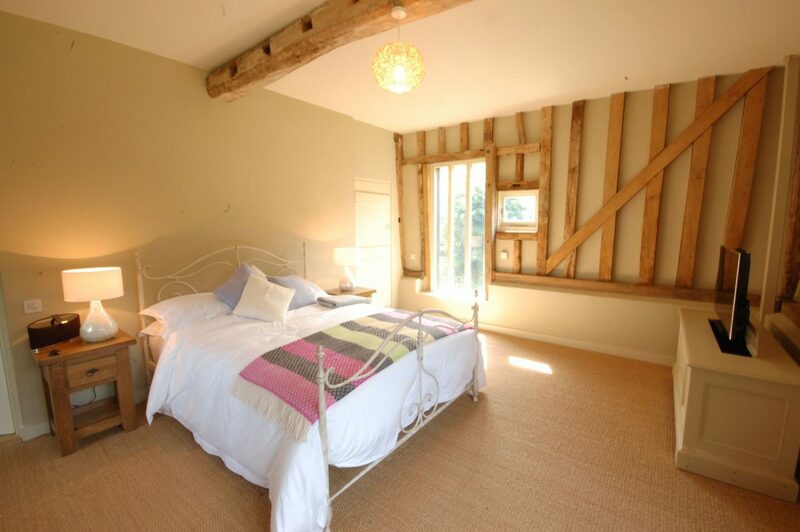 The rooms are all light, combining homely pastoral decor with bold touches. 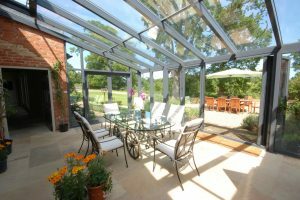 This property truly is a top of the range countryside escape for a group or family in Suffolk, oozing the high quality of a countryside estate. If you are interested in this property, please call us on 01728 638962 where we will be happy to help and to check availability. The front door leads you from the garden into the conservatory hall, setting the tone for the rest of the Barn. 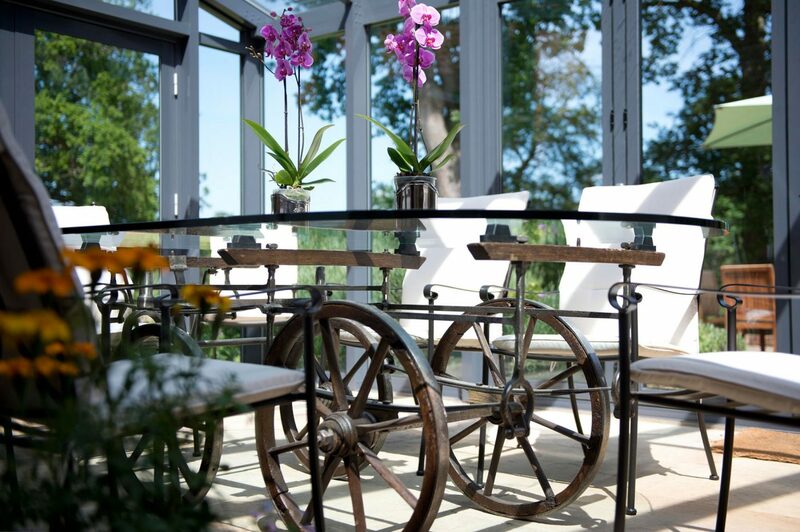 With floor to ceiling glass, bespoke glass topped table seating six. Straight ahead of you is the lavish master suite set across two levels. 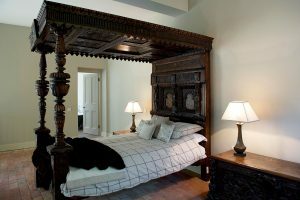 On the lower reception level is comfortable seating with the focal piece on the raised part of the room, an ornately carved four poster bed. The en-suite bathroom with roll-top bath is located just to the left of the bedroom. 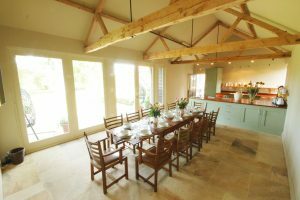 If you head through the right hand door in the conservatory you will enter the grand, country-house kitchen with a large dining table seating 10 comfortably. The ceiling is highlighted by exposed beams. 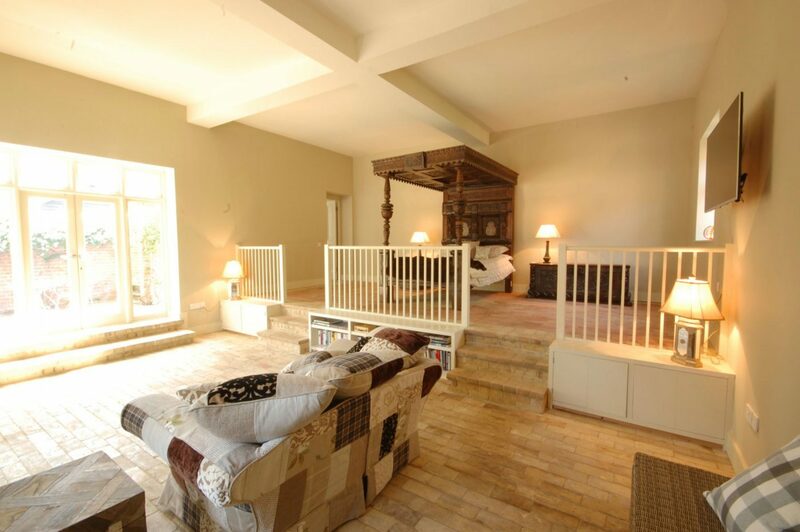 Further to the kitchen is a corridor leading to two more bedrooms, both with en-suites. 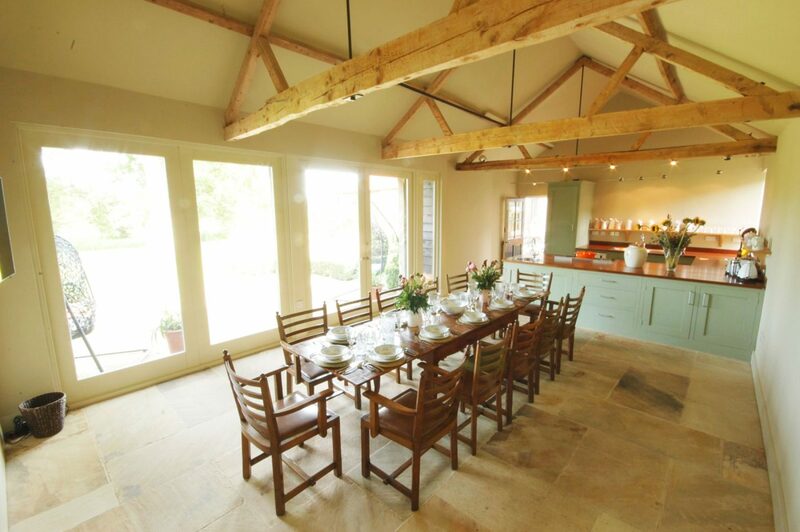 Upstairs is the main drawing room in the eaves of the Barn with views across the garden and grounds of Sibton Park. THIS PROPERTY CAN BE BOOKED ALONGSIDE THE CLOCKHOUSE AT SIBTON PARK WITH A CAPACITY OF 14,CLICK HERE TO SEE AVAILABILITY. 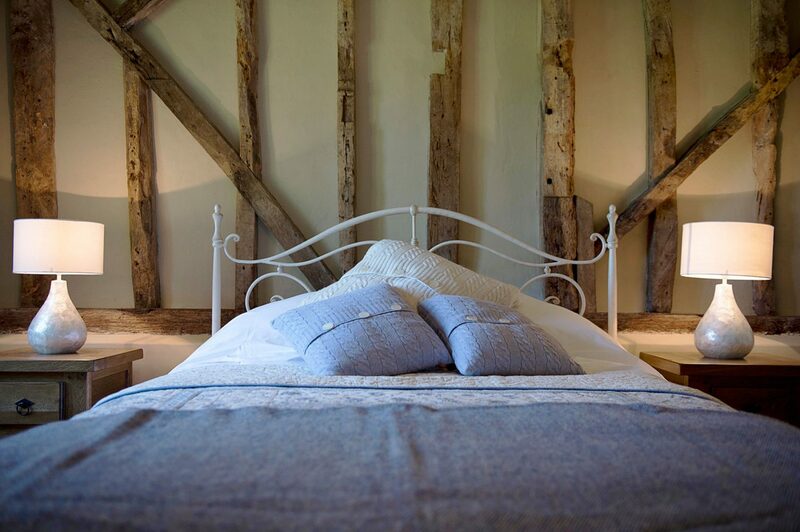 All prices include 100% cotton bed linen, towels, heating and electricity plus daily housekeeping help you get your break off to a relaxing start. 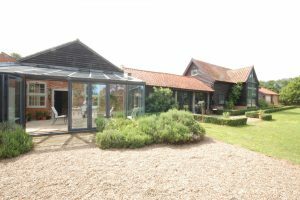 This large self-catering Suffolk country estate cottage is equipped with gas central heating. Appliances include flatscreen televisions in all bedrooms, WiFi. In the kitchen there are gas hobs, an electric oven, dishwasher, microwave, fridge and freezer. A travel cot and high chair are available on request at the time of booking. 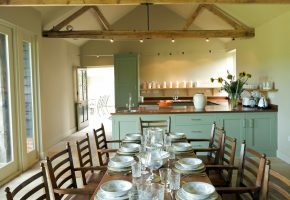 This large Suffolk self-catering country estate cottage is situated between the picturesque villages of Peasenhall and Yoxford. Peasenhall’s village's facilities include a very popular pub serving fresh local produce, a village stores, a delicatessen specialising in cured hams and Spanish produce and a family butchers selling produce from local farms. Yoxford’s facilities include a village store and a post office that sells organic produce, two pubs and two popular restaurants. It's an ideal location from which to explore Suffolk's country lanes and pretty villages and market towns and the Suffolk Heritage Coast, a short drive away. Several footpaths lead from the village over open fields into the glorious Suffolk countryside and bicycles can be stored in the enclosed back garden.